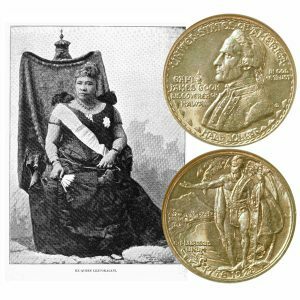 Today, the Hawaii Sesquicentennial Commemorative Silver Half Dollar Coin remembers when Queen Liliuokalani relinquished her authority on January 17, 1893. On that very night the committee assembled at the house of Henry Waterhouse, one of its members, living the next door to Mr. Stevens, and finally determined on the dethronement of the Queen, selected its officers, civil and military, and adjourned to meet the next morning. Col. J. H. Soper, an American citizen, was selected to command the military forces. At this Waterhouse meeting it was assented to by all that Mr. Stevens had agreed with the committee of safety that in the event it occupied the Government building and proclaimed a Provisional Government he would recognize it as a de facto government. When the troops were landed on Monday evening, January 16, about 5 o’clock, and began their march through the streets with their small arms, artillery, etc., a great surprise burst upon the community. To but few was it understood. Not much time elapsed before it was given out by members of the committee of safety that they were designed to support them. At the palace, with the cabinet, amongst the leaders of the Queen’s military forces, and the great body of the people who were loyal to the Queen, the apprehension came that it was a movement hostile to the existing Government. Protests were filed by the minister of foreign affairs and by the governor of the island against the landing of the troops. Messrs. Parker and Peterson testify that on Tuesday at 1 o’clock they called on Mr. Stevens, and by him were informed that in the event the Queen’s forces assailed the insurrectionary forces he would intervene. At 2:30 o’clock of the same day the members of the Provisional Government proceeded to the Government building in squads and read their proclamation. They had separated in their march to the Government building for fear of observation and arrest. There was no sign of an insurrectionary soldier on the street. The committee of safety sent to the Government building a Mr. A. S. Wilcox to see who was there, and on being informed that there were no Government forces on the grounds, proceeded in the manner I have related and read their proclamations. Just before concluding the reading of their instrument fifteen volunteer troops appeared. Within a half hour afterward some thirty or forty made their appearance. A part of the Queen’s forces, numbering 224, were located at the station house, about one-third of a mile from the Government building. The Queen, with a body of 50 troops, was located at the palace, north of the Government building about 400 yards. A little northeast of the palace and some 200 yards from it, at the barracks, was another body of 272 troops. These forces had 14 pieces of artillery, 386 rifles, and 16 revolvers. West of the Government building and across a narrow street were posted Capt. Wiltse and his troops, these likewise having artillery and small arms. The Government building is in a quadrangular-shaped piece of ground surrounded by streets. The American troops were so posted as to be in front of any movement of troops which should approach the Government building on three sides, the fourth being occupied by themselves. Any attack on the Government from the east side would expose the American troops to the direct fire of the attacking force. Any movement of troops from the palace toward the Government building in the event of a conflict between the military forces would have exposed them to the fire of the Queen’s troops. In fact, it would have been impossible for a struggle between the Queen’s forces and the forces of the committee of safety to have taken place without exposing them to the shots of the Queen’s forces. To use the language of Admiral Bkerrett, the American troops were well located if designed to promote the movement for the Provisional Government and very improperly located if only intended to protect American citizens in person and property. They were doubtless so located to suggest to the Queen and her counselors that they were in co-operation with the insurrectionary movement, and would when the emergency arose manifest it by active support. It did doubtless suggest to the men who read the proclamation that they were having the support of the American minister and naval commander and were safe from personal harm. Why had the American minister located the troops in such a situation and then assured the members of the committee of safety that on their occupation of the Government building he would recognize it as a government de facto , and as such give it support? Why was the Government building designated to them as the place which, when their proclamation was announced therefrom, would be followed by his recognition. It was not a point of any strategic consequence. It did not involve the employment of a single soldier. A building was chosen where there were no troops stationed, where there was no struggle to be made to obtain access, with an American force immediately contiguous, with the mass of the population impressed with its unfriendly attitude. Aye, more than this— before any demand for surrender had even been made on the Queen or on the commander or any officer of any of her military forces at any of the points where her troops were located, the American minister had recognized the Provisional Government and was ready to give it the support of the United States troops! Mr. Damon, the vice-president of the Provisional Government and a member of the advisory council, first went to the station house, which was in command of Marshal Wilson. The cabinet was there located. The vice-president importuned the cabinet and the military commander to yield up the military forces on the ground that the American minister had recognized the Provisional Government and that there ought to be no bloodshed. After considerable conference between Mr. Damon and the ministers he and they went to the Government building. The cabinet then and there was prevailed upon to go with the vice-president and some other friends to the Queen and urge her to acquiesce in the situation. It was pressed upon her by the ministers and other persons at that conference that it was useless for her to make any contest, because it was one with the United States; that she could file her protest against what had taken place and would be entitled to a hearing in the city of Washington. After consideration of more than an hour she finally concluded, under the advice of her cabinet and friends, to order the delivery up of her military forces to the Provisional Government under protest. That I yield to the superior force of the United States of America, whose minister plenipotentiary. His Excellency John L. Stevens, has caused United States troops to be landed at Honolulu and declared that he would support the said provisional government. Now, to avoid any collision of armed forces and perhaps the loss of life, I do, under this protest, and impelled by said force, yield my authority until such time as the Government of the United States shall, upon the facts being presented to it, undo the action of its representatives and reinstate me in the authority which I claim as the constitutional sovereign of the Hawaiian Islands. All this was accomplished without the firing of a gun, without a demand for surrender on the part of the insurrectionary forces until they had been converted into a de facto government by the recognition of the American minister with American troops, then ready to interfere in the event of an attack. In pursuance of a prearranged plan, the Government thus established hastened off commissioners to Washington to make a treaty for the purpose of annexing the Hawaiian Islands to the United States. The Hawaii Sesquicentennial Commemorative Silver Half Dollar Coin shows with an image of ex-Queen Liliuokalani, circa 1890s.